Go on and try unique Japanese gourmet meals in these delicious restaurants of Tokyo! My family and I really enjoyed the kimono experiences tour around Asakusa. The staffs are nice and they are very helpful. On arrival at one of the three Asakusa Kimono rental stores, you'll be presented with a wide array of colorful kimonos to choose from. 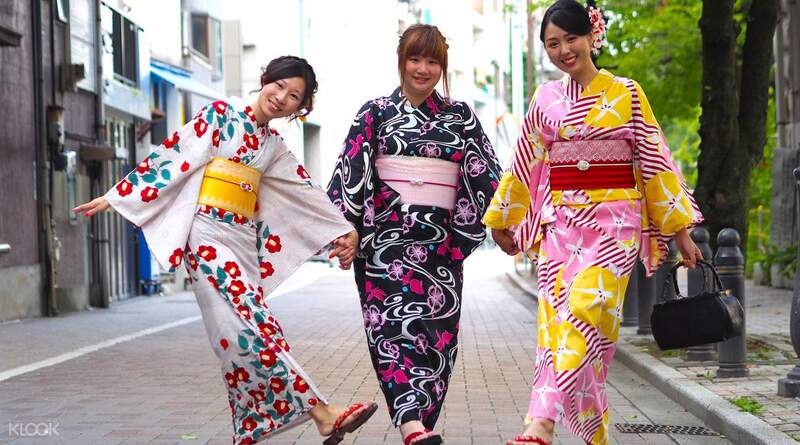 Yukata (summer kimonos) are available for the hotter months whilst the 'hakama with casual furisode' is the popular option for graduating female students, a tradition dating back to the Meiji Period. Make your selection before being whisked into the styling area where skilled experts will diligently dress you in your kimono (complete with robe, obi, bag, socks, shoes and shawl) and hair styling with decorative ornaments. 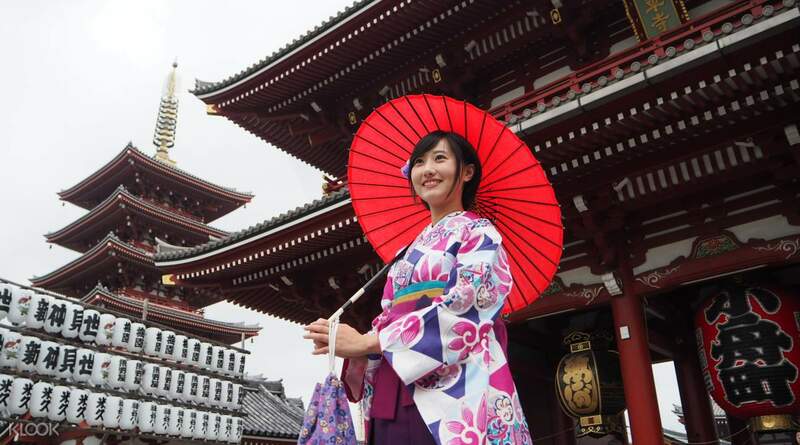 After this you'll have free time to stroll through Asakusa, an area which still retains a very traditional Tokyo atmosphere - the perfect backdrop for your photos! 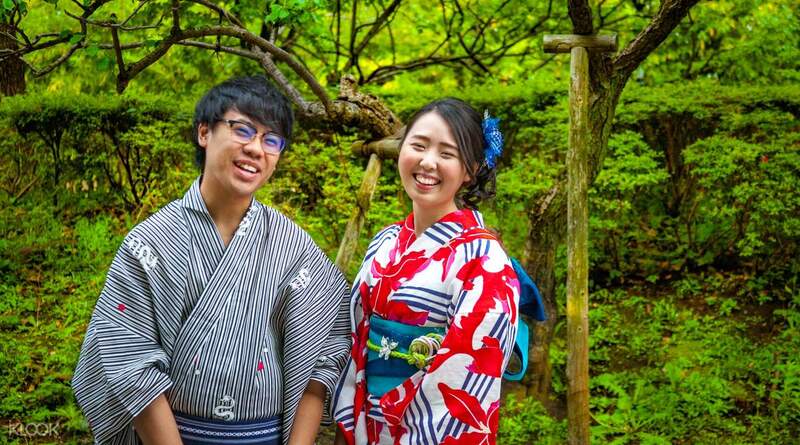 The Tokyo Kimono Experience offers a choice of packages designed for individuals, couples, friends and graduating students, and services in English, Japanese or Chinese. 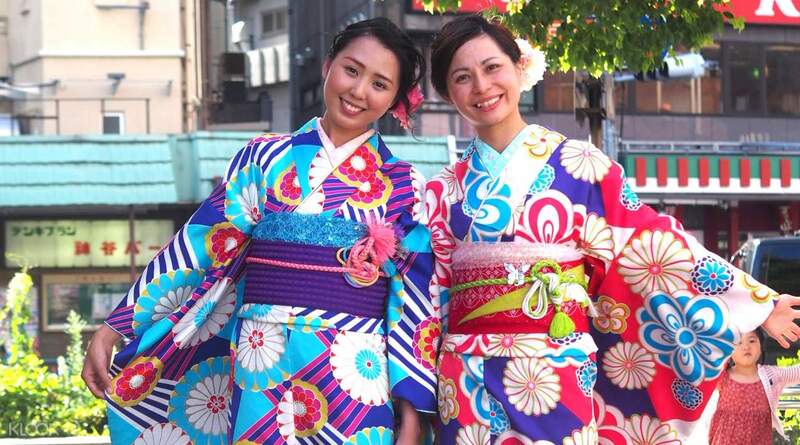 Have fun walking the historic streets of Asakusa dressed in a kimono! Additional charges for professional photography, rickshaws etc. Highly recommended Klook activity! Everyone in the store are professional and friendly. I love how the hairstylist was able to achieve the look that I want in less than 10 minutes. Overall, great experience! Highly recommended Klook activity! Everyone in the store are professional and friendly. I love how the hairstylist was able to achieve the look that I want in less than 10 minutes. Overall, great experience! First timer couples! We never had a feel in wearing kimono and this is a great experience! The overall preparations is fast. The staffs is friendly n welcoming. Walk around the park n to the sensoji temple. So happy, not a single regrets. Love it. Seriously, Recommended! First timer couples! We never had a feel in wearing kimono and this is a great experience! The overall preparations is fast. The staffs is friendly n welcoming. Walk around the park n to the sensoji temple. So happy, not a single regrets. Love it. Seriously, Recommended! My friends and I had an amazing time with Tokyo Kimono experience. When we arrived the staff for being so friendly. We choose our Kimonos and they dressed us all up. they made up the female's hair really nice and beautiful. The overall experience was actually better than I thought it would be. we had such a great time. My friends and I had an amazing time with Tokyo Kimono experience. When we arrived the staff for being so friendly. We choose our Kimonos and they dressed us all up. they made up the female's hair really nice and beautiful. The overall experience was actually better than I thought it would be. we had such a great time. The shop 2 is easy to locate with some help direction from the Tokyo cruise counter. The ladies are helpful and friendly from helping me in choosing kimono, matching bag & clog and also doing up the hairstyle. The hairdo has 6 varieties to choose from and the lady is very professional and prompt in doing up my hairstyle. There is a wide range of kimono to choose from, recommend to get the earliest slot so that have more range to choose. Man need 30mins and ladies around 1 hr to get dressed. Overall, a very nice experience to get dressed up in traditional kimono and explore around Asakusa area. The shop 2 is easy to locate with some help direction from the Tokyo cruise counter. The ladies are helpful and friendly from helping me in choosing kimono, matching bag & clog and also doing up the hairstyle. The hairdo has 6 varieties to choose from and the lady is very professional and prompt in doing up my hairstyle. There is a wide range of kimono to choose from, recommend to get the earliest slot so that have more range to choose. Man need 30mins and ladies around 1 hr to get dressed. Overall, a very nice experience to get dressed up in traditional kimono and explore around Asakusa area. Great experience. The staff were nice and helpful. The kimono was comfortable worn over my t shirt and tight pants and looked amazing. I did this on a rainy day so they provided me with an umbrella and a bag of my valuable belongings. They store your other things in a large bag on a shelf so take important stuff with you. The temple is 8 minutes away up 1 street. Make sure you allow them to do photos of you. They gave me a gift of a photo postcard at the end. Great experience. The staff were nice and helpful. The kimono was comfortable worn over my t shirt and tight pants and looked amazing. I did this on a rainy day so they provided me with an umbrella and a bag of my valuable belongings. They store your other things in a large bag on a shelf so take important stuff with you. The temple is 8 minutes away up 1 street. Make sure you allow them to do photos of you. They gave me a gift of a photo postcard at the end. Store was easy to find. Short walk to Sensoji temple where we took most our photos in our kimonos. Very friendly and accommodating staff. Nice selection of kimonos. They style your hair for free. They also give you a free postcard with your photo. Store was easy to find. Short walk to Sensoji temple where we took most our photos in our kimonos. Very friendly and accommodating staff. Nice selection of kimonos. They style your hair for free. They also give you a free postcard with your photo. My family & I took the 10.30am slot & there were already people lining up for their kimono hairdo & dresses. The people that work there were really professional & really friendly as well & they took care of my nephew while my sister & i were getting our kimono & hairstyles done. As we need to return the clothes by 4.30pm we quickly went to Sensoji Temple & ate lunch at the nearby place. By 3pm sensoji temple was already packed with tourists so we left & returned our clothes by 3.30pm. All in all, it was a great experience & I would recommend this Experience to all🙂. My family & I took the 10.30am slot & there were already people lining up for their kimono hairdo & dresses. The people that work there were really professional & really friendly as well & they took care of my nephew while my sister & i were getting our kimono & hairstyles done. As we need to return the clothes by 4.30pm we quickly went to Sensoji Temple & ate lunch at the nearby place. By 3pm sensoji temple was already packed with tourists so we left & returned our clothes by 3.30pm. All in all, it was a great experience & I would recommend this Experience to all🙂. The best experience so far and the ladies in the shop are accommodating and very courteous! I would try it again next time wearing a different kimono. The place was also easy to find and with great view nearby. Also near the temple / shrine in Asakusa. The best experience so far and the ladies in the shop are accommodating and very courteous! I would try it again next time wearing a different kimono. The place was also easy to find and with great view nearby. Also near the temple / shrine in Asakusa. This was such an amazing experience! We LOVED every minute of it from picking out our colorful Kimonos, to having the staff carefully dress us, to picking out how we wanted our hair styled and hair accessory! We went around historical sites and took pictures. What's fun is that we became tourist attractions as we were walking around - a lot of people wanted to take pictures with us and of us. Plus, the Kimonos were in immaculately clean and new condition. It was so fun, I highly recommend it! This was such an amazing experience! We LOVED every minute of it from picking out our colorful Kimonos, to having the staff carefully dress us, to picking out how we wanted our hair styled and hair accessory! We went around historical sites and took pictures. What's fun is that we became tourist attractions as we were walking around - a lot of people wanted to take pictures with us and of us. Plus, the Kimonos were in immaculately clean and new condition. It was so fun, I highly recommend it! Q: Are there any kimonos for kids to wear? A: Yes, there are kimono sizes that will fit children 80 cm to 140 cm tall, but these are not available on Klook and can only be reserved on the spot. Please ask the staff for assistance during your visit. Q: Is there a professional photo service available for this experience? A: Yes. There is a professional photography company on site that can take pictures. Please see the official website for plans and pricing. Q: Does this experience include hair styling? A: Yes. Simple hair styling is included with the experience. Additional hair styles are also available for a JPY 2000 per person surcharge. Please note that elaborate hair styling may not be possible. Please consult the stylist to see what will work best for you. Q: Can the staff speak other languages besides Japanese? A: Yes. There are staff members who can speak English and Chinese.